nOir is having their super-fun sample sale. What to go for: the iconic rings! Price points include: giant cocktail rings $15-$65, pyramid & animal rings $50-$95, necklaces $15-$75, bracelets and bangles $5-$50, and earrings $10-$40. 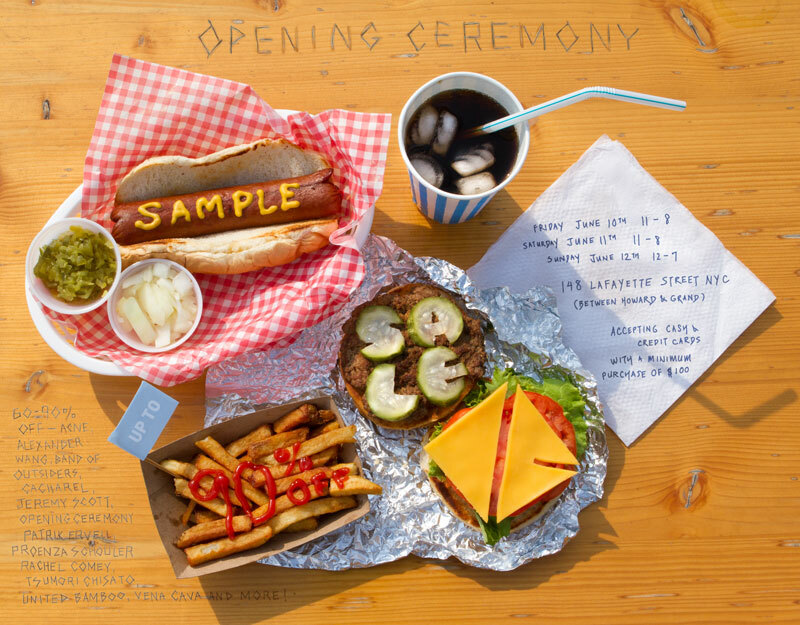 The Opening Ceremony sample sale is always a lot of fun. Bring cash because they only accept credit card for purchases $100+. Shop Catherine Malandrino online and take 20% off using code "HOLIDAY". Ends Monday, May 30. It has REALLY gotten hot here in the city, and now I am definitely in the mood to shop for cute little sundresses. +40% summer clothing during TheOutnet.com's weekend flash sale. Up to 60% off, and a free reusable tote for purchases $100+. YOOX.com's sale has hit 30% off. Ella Moss has a good selection of items at 40% off, and shipping is free! Tibi.com is having an online sample sale. Up to 60% off and ends Friday, May 27. Enter your email address to get in. Smashbox is doing 20% off during their F&F event. Use code "FF2011" until Friday, May 27th. Makeup kit staple Stila is also running their F&F now. 20% off using code "FRIENDS11" and free shipping. Ends Tuesday, May 24th. Can not get enough. Now through Monday May 23rd, take 20% off your purchase online or in-stores. Use code "SPRINGLOVE". More sample sales, courtesy of NYMag. Past-season clothes and shoes by 3.1 Phillip Lim, Isabel Marant, Dries Van Noten, Tsumori Chisato, Rachel Comey, and more are $25 to $200 at the Bird closet sale. Men's shirting is $25 and all full-price spring/summer 2011 merchandise is 20 percent off. Dresses, knits, pants, jackets, costume jewelry, and belts are 50 to 80 percent off at the Lela Rose ready-to-wear sample sale. Blouses are $425 (originally $795), skirts are $295 (originally $695), and dresses are $995 (originally $1,595). Womenswear by Ali Ro is up to 70 percent off. Camis, briefs, thongs, pajamas, swimsuits, and more are 50 to 70 percent off at the Eberjey sample sale. Shop deep discounts at the Derek Lam spring 2011 sale. The stretch-canvas peplum-back blazer is $295 (originally $1,090), the cotton-voile embroidered dress is $395 (originally $1,490), and the stretch-cotton trench coat is $275 (originally $990). Shoes and clothing are discounted at the Dolce Vita warehouse sale. Sandals start at $19, flats and oxfords start at $29, and boots and booties start at $59. Apparel brands include Cynthia Vincent, Mink Pink, Sass and Bide, Blank denim, and more. All womenswear is 50 to 80 percent off at the Chloe & Reese sample sale. Handbags, footwear, and small accessories are up to 75 percent off at the Be & D sample sale. The Genesis bag in praline is $495 (originally $1,095), the Joe ballet flat in leopard is $175 (originally $350), and the Woodstock hobo in tiger-print is $795 (originally $1,485). One-of-a-kind samples are $30 to $50 at the Tracy Reese, Plenty, and Frock! sample sale. The Tracy Reese black toile tiered gown is $150 (originally $525), the Plenty by Tracy Reese floral inset strapless dress is $99 (originally $258), and the Frock! Laurisa dress is $99 (originally $228). Use your email to get in to the Kate Spade sample sale. Not tons left, but if you love Me & Ro, you'll probably find something to love. YOOX.com has started their summer sales at 20% off. Also free shipping through Monday, May 23rd. The sample sale I love love love starts tomorrow! Ready your engines. Up to 40% off a selection of goodies. Ends Sunday, May 29th. Shamelessly stolen off NYMag.com, here are some sample sales that start today, plus the notorious CL sample sale. Printed dresses, beaded sweaters, tops, suiting separates, knits, and handbags are discounted at the Nanette Lepore sample sale. Dresses are $145 (originally $398), jackets are $195 to $275 (originally $448 to $698), and skirts, pants, and tops are $95 (originally $298). Shop discounted womenswewar and menswear at the Yigal Azrouel sample sale. Ready-to-wear dresses are $375 (originally $1,240), tops are $150 (originally $495), and pants are $110 (originally $360). Men's ready-to-wear tees are $70 (originally $235), shirts are $80 (originally $270), and jackets are $285 (originally $945). 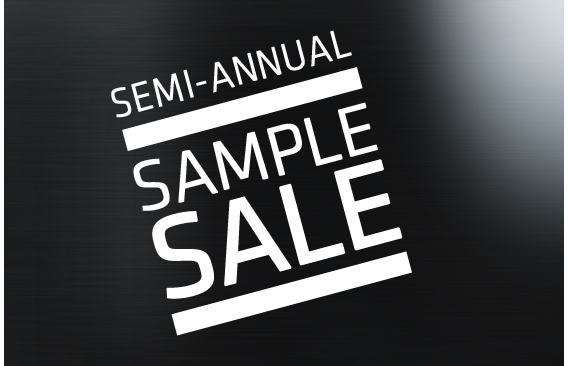 Shop discounts of up to 65 percent at the Theory men's and women's sample sale. Dresses are $109, jackets are 159, skirts are $89, and pants are $99. High-end heels are $150 to $400 at the Christian Louboutin sale. I feel like I have been gone for FOREVER!!! First there I was a bridesmaid in my friend Angela's wedding in Houston, which was gorgeous and festive, and then I went the completely opposite direction and spent 3 days squirreled away in really boring Parsippany, NJ for an off-site meeting. Then these past few days I've been helping my uncle and my mom clean out my grandmother's house out in Queens. My grandma is a hoarder!! It was terrible! Inhabit has launched an online sample sale with items (even cashmere) priced up to 80% off. Shopbop F&F is going on right now. 15% off everything using code "INTHEFAMILY15" until Wednesday, May 11. 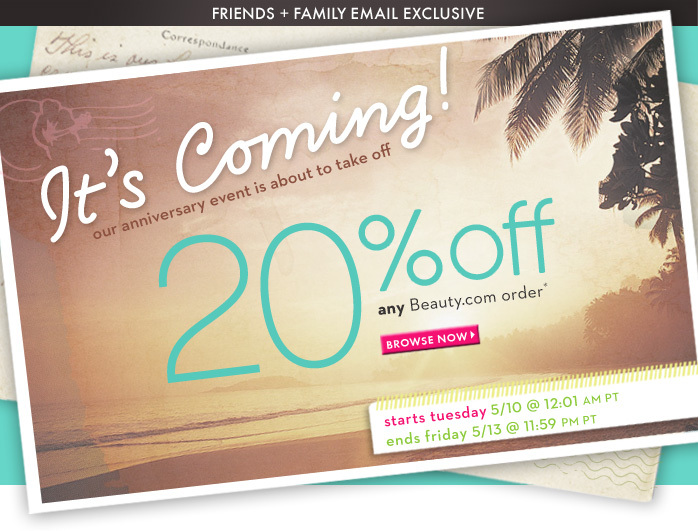 On Tuesday, Beauty.com is starting their F&F event. 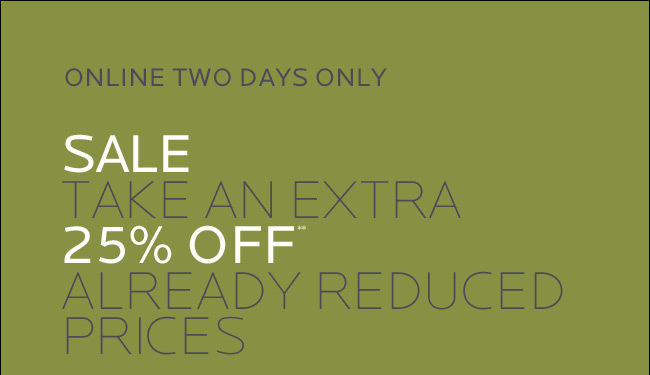 20% off everything except Jane Iredale. Ends Friday, May 13. For every $250 you spend, get a $25 gift card. YOOX.com has started their semi-annual sample sale! Up to 90% off. Ends Monday, May 9. 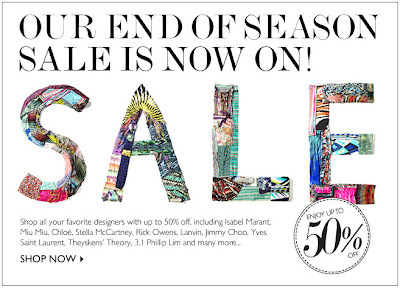 Neiman Marcus is doing an extra +25% off sale!